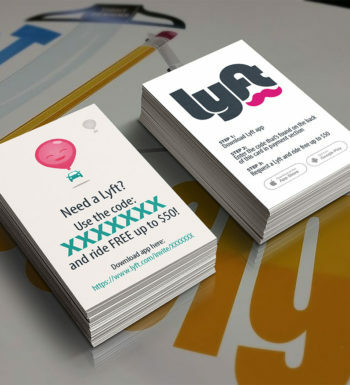 Maximize your ride-share profits with business cards and car magnets that show your driver referral code. Just like Uber, Lyft is a ride-sharing service that lets people set their own times to work and drive their own cars for commissions. 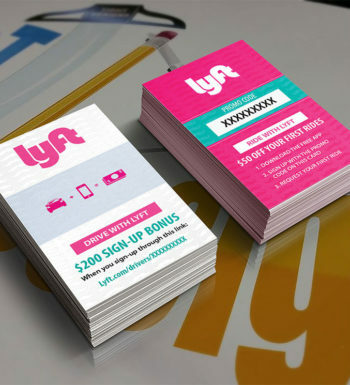 Here are some promotional printing products we offer to help with Lyft marketing. Passenger and Driver referrals are an essential part of growing the Lyft community! As a driver, in participating cities, you can get a $10 bonus for referring new passengers and even more for referring new drivers. Each new passenger can only have one referral on their account. Here’s how to get credit for referring new passengers. Please note that if a passenger has already requested you as their driver, it’s too late for them to enter your code. Only new passengers (those who haven’t requested a ride) are able to redeem referral codes. 1) Log into the Referral Portal. 2) Click on your code — it should open into a new tab in your browser. Copy the link (it’ll start off with www.lyft.com/invited). 3) Feel free to post your link to any of your social media channels — Facebook, Twitter, Instagram, etc. Lyft will not honor referrals that were obtained via paid or unpaid ads, including Google Adwords, Craigslist, Twitter, Facebook or any online advertising platform. Please keep in mind that referral bonuses are only active in select cities. When someone clicks your link, they’ll be guided through the sign-up process. You’ll both be to take part in any promos that apply. New passengers can enter your code directly into their app upon sign-up or before they request a ride, and you’ll both be take part in any active promos. Many drivers print referral cards with their code and hand them out at bars, concerts, etc. You can order referral cards with your referral code on them. Check out available options below. Drivers: For details on referral amounts in your city, please visit the Referral Portal. If the new passenger is in one of the qualifying cities below, and uses the ride credit before it expires, you’ll receive a $10 bonus. Any bonuses you receive are also shown on your daily summaries. 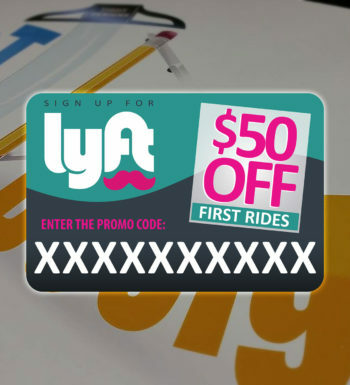 Referred passengers: You will receive a ride credit if you redeem your code in an eligible city. Depending on the city, this amount can vary. Anything over the referral amount will go on the card on file. Please check the Lyft app. Eligible Cities: Ann Arbor, Atlanta, Austin, Bakersfield, Baltimore, Boston, Charleston, Charlotte, Chicago, Cincinnati, Cleveland, Colorado Springs, Corpus Christi, Dallas, Denver, Detroit, Fresno, Honolulu, Indianapolis, Jacksonville, Las Vegas, Lexington, Lincoln, Los Angeles, Louisville, Madison, Memphis, Miami, Milwaukee, Minneapolis-St.Paul, Modesto, Napa and Sonoma County, Nashville, New Jersey, New York City, Oklahoma City, Omaha, Orange County, Orlando, Philadelphia, Pittsburgh, Phoenix, Portland, Providence, Raleigh, Sacramento, Salt Lake City, San Antonio, San Bernardino, San Diego, San Francisco, Santa Barbara, Seattle, Silicon Valley, Spokane, Tampa Bay, Toledo, Tucson, Tulsa, Washington, D.C., and Virginia Beach. Participating cities and limited time only.